The AMS-119 Geara Doga is a mass-production general-purpose mobile suit. At first glance, this drab olive mech seen in Char’s Counterattack and Gundam Unicorn doesn’t look like anything special. However, this detailed Master Grade rendition really brings out its charms. 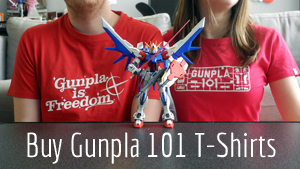 Gunpla 101 contributor Erich shows us why this Gunpla kit shouldn’t be overlooked. The average Gundam fan’s idea of a badass general-purpose mobile suit is the Zaku. And while the Zaku is cool, I’m here to remind you it’s not the only manly green machine of destruction on the market. For a break from the norm, why not try a Geara Doga instead? Just holding the box for the MG Geara Doga was enough to activate that Gunpla kit itch inside of me—you know, the one that screams “Build it, build it, build it!” when you find a great kit. Just looking at the cool pose on the side of the box inspired me to get going. The MG AMS-119 Geara Doga has one of the best designed inner frames in an MG to date. I don’t say this lightly: sometimes I remove the armor on my finished kit just to look at it. Perhaps compared to that engineering, the standard two-tone exterior armor is pretty ordinary. Highlights include that spiked shoulder armor inherited from the Zaku and the rectangular angled shield. The head is a visual improvement over your usual MS—it gives the impression of an imposing yet calculating presence behind that terrifying monoeye gaze. If you want to dial up the drama, it can even fit a Bandai LED unit (not included in the kit) behind the eye. One aspect I did not like, however, was the rubber pieces you have for the power pipes. Try as I might, I could not get them to stay in place. For a straight build that isn’t a problem, but if you’re like me and like to paint your kits, you may want to glue them in place. The rubber parts as seen under the helmet. I painted them copper and then glued them in place. This kit has an obvious elevation in difficulty simply because it is a Master Grade kit. You will need to be patient because there’s no way you can assemble this kit in one setting—there are simply too many parts to put together. This is coming from somebody who has assembled nearly 65 Gunpla kits in my life! In fact, I’d say the Geara Doga has even more parts than the average Master Grade kit in my experience. Pay attention to the polycaps! Do you remember I called this kit a manly machine of destruction? Well, you will need force and determination to insert those, and I mean real force because you’ll need to push the polycaps in as hard as you can! Since you’ll be pushing them in too far to easily undo, be sure to look at the instructions twice to confirm that you are putting the piece correctly the first time. With its impressively detailed inner frame, the Geara Doga granted a great articulation versatility. It can hold itself without the need of any action base, as expected from a ground unit that doesn’t need to be posed as if it’s in space or mid-flight. The inner frame, especially the knees and arms, has quite a range of mobility, but once you put the armor, the movement will be reduced greatly. Even so, I was able to pose the Geara Doga in a number of different positions without trouble. The head lags behind the rest when it comes to movement, simply capable of turning to the side. Guess that’s the downside of such a commanding cranial design. Posed with the optional axe beam. The action base was not included with this kit. The kit comes with quite an arsenal: two rifles and two beam hand weapons—a sword and an axe. Additionally, the axe comes with an optional pointy effect. You get also an extra helmet to convert your Geara Doga to commander type, plus some closed fist extra hands. My favorite extra is the big shield, which is a real attention grabber. There’s a joint on it that makes for some dynamic poses. It can hold and hide up to four grenade launchers. If you’re looking for a big challenge that pays off with unexpected dramatic presence and an appealing design from the inner frame out, this is a great choice. I loved assembling this bad guy—maybe in part because I tend to prefer the bad fellas to the heroes anyway. In some of the photos, you can see I did some additional customization. I ended up gluing the rubber parts in place and covering them with metallic copper-colored paint. I was going to fully paint the kit, but the original green color looks so good that I changed my mind and just added a matte top coat and did some shading with chalk pastels. To top it all off, I did some dry brush touch ups to add the appearance of rust and battle-worn experience. I photographed the Geara Doga against a black backdrop to emphasize it as the enemy kit that it is. If you want to add a dramatic bad guy to your collection, this is my pick. Erich is a passionate hobbyist with a taste for modifying kits to his own design. He has been working with RC cars and Lego for most of his life and recently discovered Gunpla in 2017. He likes combining his builds with his biggest passion: photography. But most of all, he loves sharing his toys with his two kids. He is located in Chile and you can find his latest facebook fan page for Gunpla at Erich’s Modelling Corner.